These are the "thickest" available. Dodge, Chevy and Ford logos too! Now that you've got that new GMC you certainly don't want it scratched. Now is the time GMC truck bed mats may come to mind. Whether you call them bed truck mats or truck bed mats they are not all the same. The rubber truck bed mats you get at a discount store might not be thick enough to lay flat in your bed at high speeds. They tend to float and curl up next to the front wall and do no good at all. To avoid this "floating" you need to gat a mat that is at least 3/8" thick. A truck bed mat this thick has enough weight to keep it where it is supposed to be (about 50lbs.) and give you the continuous protection you need. This type of truck bed protection has always been the "best bang for the buck". 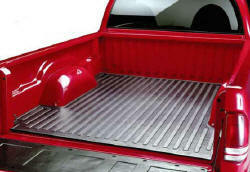 Mats are "truck specific" and come custom fit for your pickup. They have the added advantage of being easy on the knees. You may find yourself in a situation where you have to climb around in the back of your truck and will appreciate the rubber under your knees. One of the reasons people pick a mat over a liner is to keep from rubbing the paint off the bed and defeating the whole purpose of "protection". When you protect the bed ... you are also protecting the value of your truck at trade in. The NADA used truck buyers guide lists truck bed protection as an "add on" value. One disadvantage of rubber truck bed mats are that they don't give you sidewall and front protection. Cargo that rolls around may dent or scratch the unprotected areas. If you feel your need protection for the front, sides and tailgate you should take a look at the bedliner/mat hybrid called the "Dual Comp". This is a new twist to truck bed protection. It uses an LRV custom bed mat (3/8") for the floor and has modular plastic pieces for the tailgate, sides and front. Your cargo wont slide around like it will in a drop in liner and there are no hard ribs to dig into the knees. The bed mat reduces the type of rub damage you get with a full drop in liner. Here's the best thing ... it can be shipped UPS or DHL (DHL is about half the cost of UPS so try and get your supplier to use them) instead of having to go "common carrier" which sometimes costs as much as the liner itself. The Dual Comp comes packaged in a box and only takes minutes to install. They have only been on the market for a year or so and are limited in their applications but they are available for most new full size pickups.